I have found that we are constantly in one of four very distinct seasons of life. 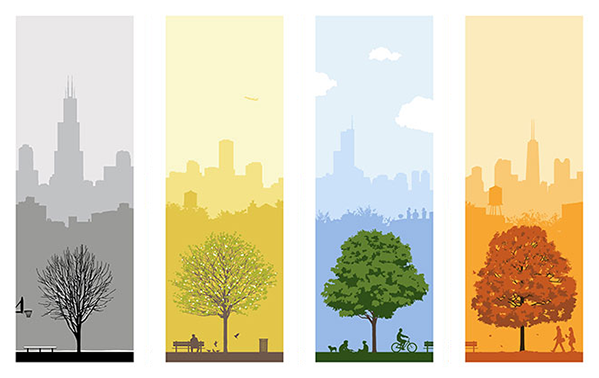 And these four seasons tend to cycle. I’m sure you can relate. Mountain top | This seems to be the shortest season. But it also tends to be the time in life when we don’t seek after God as aggressively. This makes sense, right? When everything is going great, marriage is solid, and the car is running well…we often find ourselves not NEEDING GOD as much. Heading into a valley | You know this season. It is inevitable and you can virtually sense things rolling down hill with increasing momentum. It’s Monday morning. You receive a disturbing phone call on your way to work. The car breaks down on the highway. Maybe uncomfortable changes are on the horizon at work or in your church. This season is not horrible, but it’s an indication of things getting harder. And they’re usually just around the corner. In the Valley | This one…..well, it’s just terrible. It’s the polar opposite of the Mountain Top season and lasts quite a while (or at least appears to). Crying ourselves to sleep at night and waking up with a sarcastic outlook on each new day is pretty common. This season is so bad and so difficult to maneuver through, believers can actually experience a deeper and richer intimacy with Jesus. We tend to search harder, pray more often, and look for evidence of His activity in our lives with more detail than every before. Heading to the mountain top | Relief!!! It’s here. Can’t you feel it? Subtle signs of hope begin popping up in areas where pain and discouragement were just the other day. This fuels us with new energy for life and a positive look forward into tomorrow. So, what can we do when we’re in the two most challenging seasons of life? Here are four practices I have personally learned to be life-saving for me over the years. 1. Stay in God’s Word | “Be strong and courageous. Do not fear or be in dread of them, for it is the Lord your God who goes with you. He will not leave you or forsake you.” (Deut. 31:6) The Bible is packed full of encouraging, insightful, and knowledgable passages like this. More than this, though, it is God’s Word. He uses the Holy Spirit to speak and reveal things from His heart to ours through reading the Bible. In the dark seasons it’s less about how much we read, and more about reading anything in God’s Word every day. 2. Get out of the house | Surround yourself with others. People who genuinely love you and have your best interests in mind are going to be encouragers to you. They can also be a powerful sounding board in you situation. God chooses to speak to us through other healthy believers quite regularly. Seek them out. Take a risk and let others into your life. This rarely ends badly. 3. Read | Find a book or blog that deals with your season of life. Something that you find helpful and encouraging or challenging. Ask a friend or pastor for names of good Christian authors they read. Reading helps redirect our attention away from our own stress and worry. It provides positive food for our mental energies. Find something today and dig in! 4. Pray for the difficult things | It’s one thing to pray for help, strength, or simply the need for the next ‘feel good’ season to come quickly. To accept the season we are in, however, and ask the Lord to teach us something new is a whole new approach. It’s hard, but take intentional moments to set aside your pain and dismay in order to ask God to grow your understanding of Him and His will. What season are you in today? What did you learn, or how did you grow, from your previous season? Leave a comment below. Let’s grow in this life together.